Smithsonian Science How is back with an all-new series of webcasts! This year, teachers can bring more Smithsonian scientists into the classroom through a live television-style program that is streamed through the web. Over the past four years, the SSEC has immersed itself in a $35+ million U.S. Department of Education Investing in Innovation (i3) grant: the "LASER i3" project. With a full-time team of roughly 8, the SSEC has been implementing its approach to science education (the LASER model) in 125 schools across northern New Mexico, North Carolina, and Houston, Texas. The following blog was written by LASER i3 New Mexico teacher and Site Coordinator Chrissy Romero. Ms. Romero teaches at Gonzales Community School in Santa Fe, New Mexico and has been an immeasurable asset to the LASER i3 project since the first summer of training in 2011. Ms. Romero has demonstrated exceptional commitment to the program; she has supported and trained her fellow teachers, and she has been involved as both participant and faculty member at leadership development institutes. 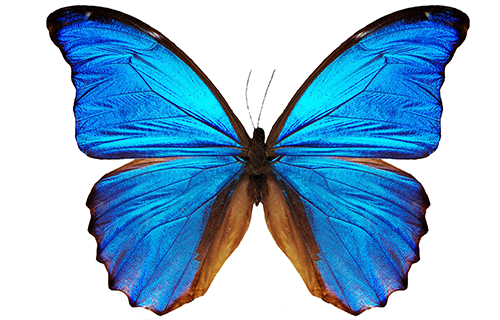 The SSEC would like to thank Ms.
A Morpho butterfly looks like this.